This week I have added five new apps to my iPad and thought I’d post them here. The whole post was made on the iPad all text ‘written’ with Dragon Dictation. The first is BBC News and this is just a translation of the BBC’s new site for the iPad that it works very nicely. It’s pretty slick there is a series of all news feeds on the left and you could see the articles on the right. You can customise the feeds so I’ve already remove sport and added the Scottish news it seems very iPad friendly and like quite a few designed read and access media in an attractive way. Another media viewer I’ve installed is FlipBoard which has been getting a lot of attention on the Internet and on twitter. This app pulls information from different sources, Facebook or twitter and from collections and about different things, say technology or entertainment.the app presents these streams in an attractive way. You can to flip through the pages with some pretty effects. What I think is really impressive that is with the tweets from your twitter stream it doesn’t just to show the tweets, if a tweet has an article linked it will present some of the article, with a photograph that will present the photograph. FlipBoard has been a little controversial as it is pulling in content by scraping rather than they’re getting it from RSS feeds. To me this doesn’t seem too much of a problem most of the longer articles are shortened so you need to display the source along with any adverts and branding to read the whole thing. This viewing is done in the app rather than in safari. The next app is regexecutioner which is an app to help learn about regular expressions. I do occasionally attempting to learn and to use snippets of regular expressions. Hopefully this may get me up to speed. It is a pretty straightforward app were you can see examples and you can take a regular expression and a text block instantly see it’s result. 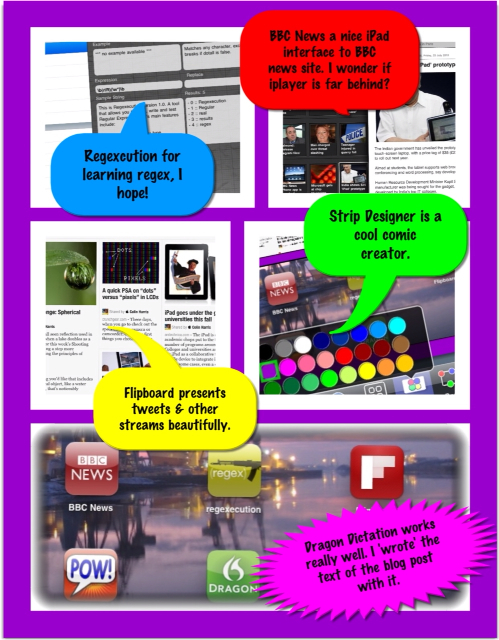 StripDesigner is more of a creative app. You can see from the screen shots that are illustrating this post that I have used it to present and annotate some screenshots of these application. It’s a really nice ComicLife clone. I tried on the iPhone first there the screen space is a wee bit limited but on the iPad and it just works very nicely indeed. You can choose different layouts of up to five pictures. You can add texts and the other things, adjusting fonts, text size and drop shadows in an easy and intuitive way. I think it would be a great application to use in a classroom and I imagine I’ll be using it quite a lot. The final application I’ve installed this week is Dragon Dictation which is an amazing application. I have recorded all of this post and it turned into text using Dragon Dictation it is very straightforward to use: you press a record button, you talk, you hit the Screen to stop. Dragon then analyses this (I imagine it sens the audio to a server) and brings back the text. You can quickly clean up and edit the text. I tried it first on my iPhone you can tweet straight from Speech. I then they tried on the iPad and had one crash so made sure to a copy of each section of this post as i recorded six different sections. I had to do a little cleaning up, but given my accent and the fact that there is no training period make this application seem like magic.